When Andrew completed Dave Infuriators for the Sam Coupe, he was also keen to create a ZX Spectrum version of it, as the user base is much larger, as well as the fact he found it reasonably easy and similar to transfer the code. 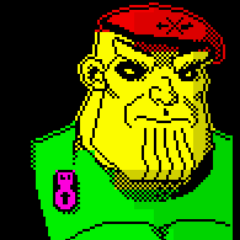 This left me to use the Sam graphics I previously created and tweak it using ZX Paintbrush to make it the best I could for the Speccy palette. I thought it turned out well and the game was fairly well received on the Speccy scene. However, people found it hard (as was expected).